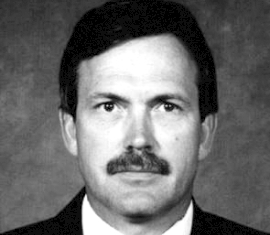 Special Agent Harton was killed by an intoxicated motorist. At 9:20 a.m., Agent Harton was driving his police agency vehicle northbound on Interstate 15 near 3900 South. As the 41-year-old victim changed lanes, he was struck from behind by a vehicle operated at a high rate of speed. The collision caused Agent Harton’s vehicle to roll several times. Although wearing his seatbelt, he suffered severe head injuries and died at St. Mark’s Hospital. The intoxicated motorist was charged with DUI and automobile homicide. Agent Harton was married and the father of five children. He is buried in Valley View Cemetery, Salt Lake City. His bronze name plaque is sponsored by his widow, Connie Harton.